The Society of Canadian Artists 50th Open International Exhibition welcomed Canadian Art lovers on July 26 at Papermill Gallery, Todmorden Mills Heritage Museum. The show is an outstanding representation of Art in Canada. From realism to abstraction, and emerging to established; the variety of artwork from across Canada is a rare treat for art lovers and art collectors alike. Earlier in July, I shipped my new work to this exhibition, and am thrilled to see my painting, ‘Balance’ made the cover of the show catalogue. After 50 years of the show, this is the first year an exhibition catalogue was published. 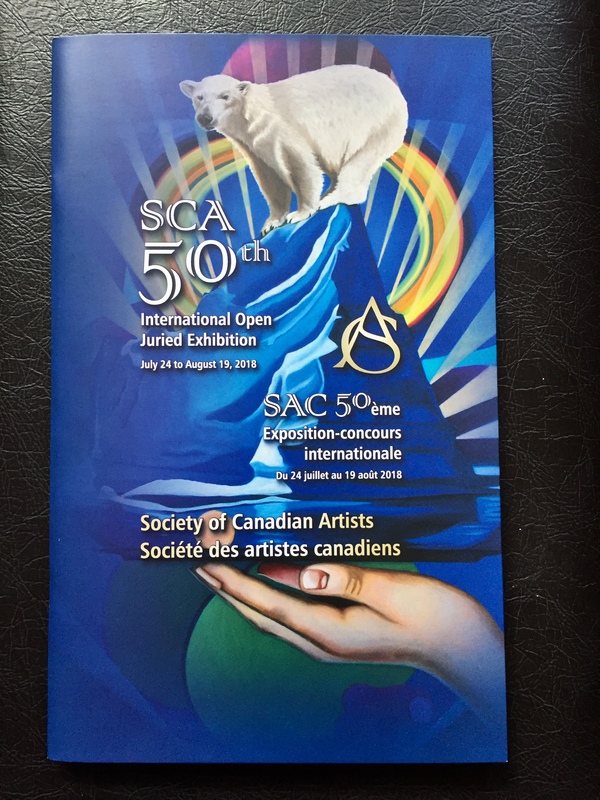 The SCA 50th International Open Juried Exhibition Catalogue, Library and Archives Canada Cataloguing in Publication ISBN / ISMN 978-1-7750038-3-0 is published by the Society of Canadian Artists, designed by DEL ART and printed by Nova Printing. 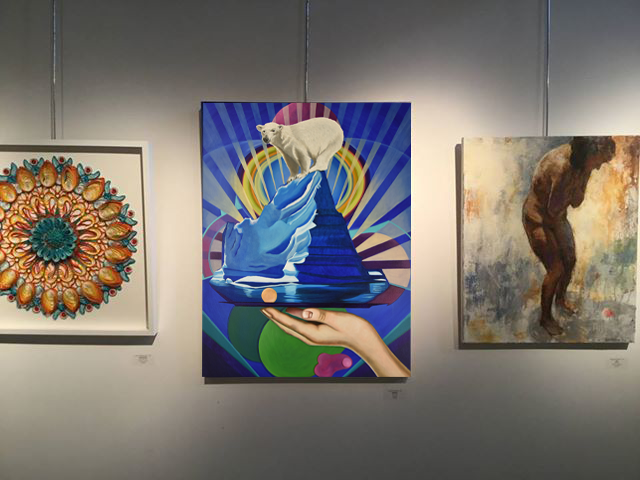 This is the first time the painting ‘Balance’ – depicting a polar bear balancing precariously on an iceberg, uplifted by a female hand, has been exhibited to the public. The painting is contemporary, timely, and highly detailed with realistic foreground imagery and more abstract shapes and colours occupying the background of the piece. The piece is part of a new series of paintings, re-imagining landscape painting in Canada. These ‘portraits of the landscape’ are filled with symbolism, and radiate joy with their saturated colour palettes. ‘Balance’ will be on view and available for purchase until August 19th. Original story and show information here.